Posted on May 20, 2014 Posted in America, Cakes	. We saw cake-pops, marshmallows and salted caramel sweet treat baking trends last year. This year is an interesting one, where one trend really caught my eye and became a must on my list to experiment with – the sweet and salty combo, more specifically salted bacon praline. Very interesting, sugar and bacon – how gross. However, the sugar and bacon comb delivers sweet and salty, which is the big craze at current. French toast with maple syrup and bacon is a norm in America on diner breakfast menus that is slowly migrating onto AUS breakfast menus (think brioche bread, mascarpone cheese, bacon and maple syrup – sometimes with poached pears). So after doing some research (at a few cafes for breakfast of course) I decided to make a choc bacon cake and cupcakes and top it off with maple icing and bacon praline. 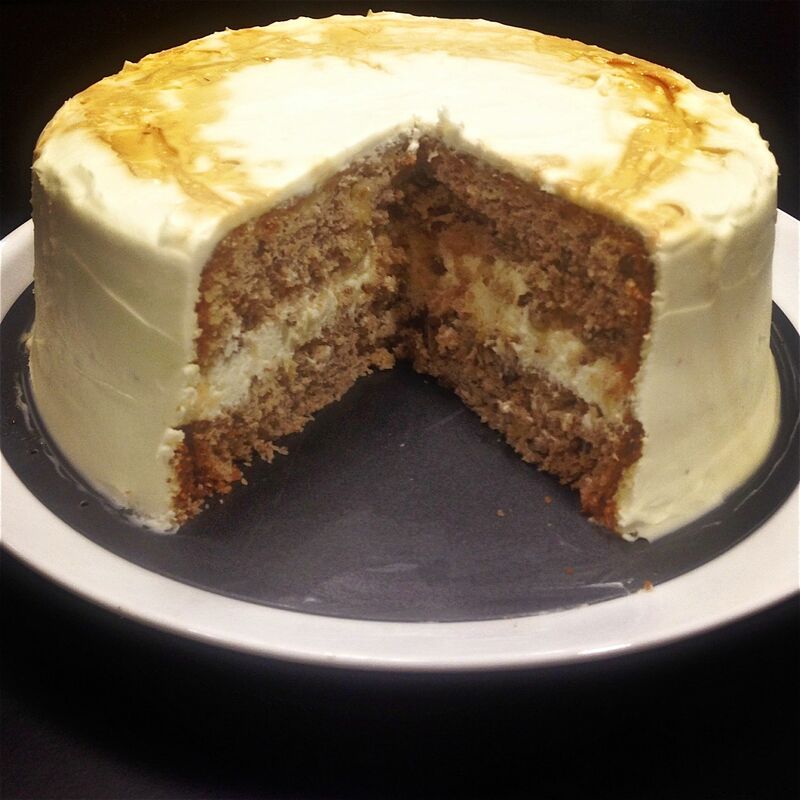 Don’t knock this until you try it, you can’t taste the bacon in the cake but the sweet-salty taste is quite amazing. Pre-heat oven to 180c and line a 25cm round cake tin with baking paper. 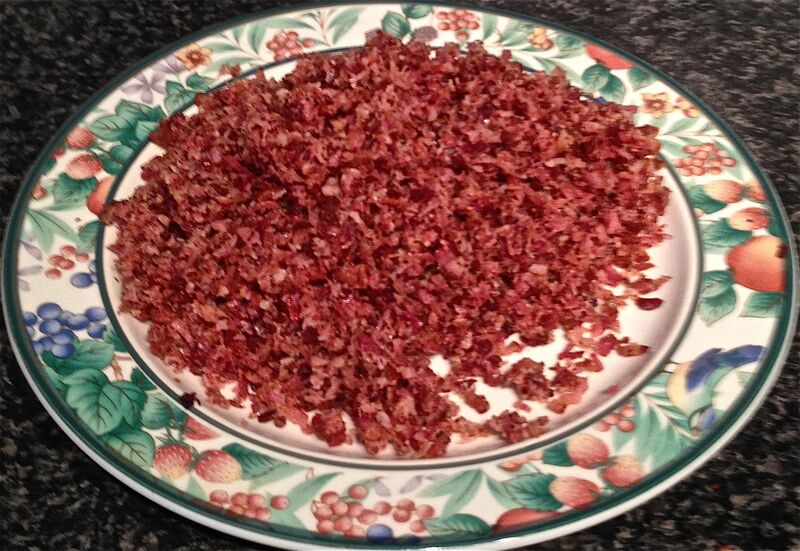 Place bacon in a frying pan and fry for 10 mins or until crisp and brown. Place the bacon onto paper towel to drain off excess oil. Place the bacon in a food processor until fine. Sift the flour, cocoa, sugar, baking powder, salt and baking soda in a bowl, mix together. In another bowl whisk by hand the eggs, coffee, buttermilk and butter. 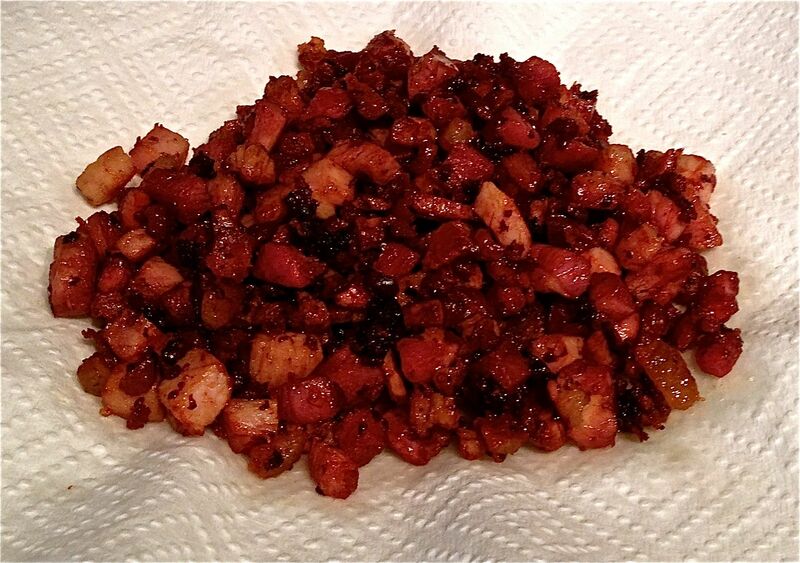 Place the wet mix and ¾ cup bacon into the dry mix bowl and whisk together until just mixed through. Bake in the oven for 45-50 minutes or until a skewer inserted into the middle of the cake comes out clean. Cool in tin for 10 minutes then on a baking rack until cool. 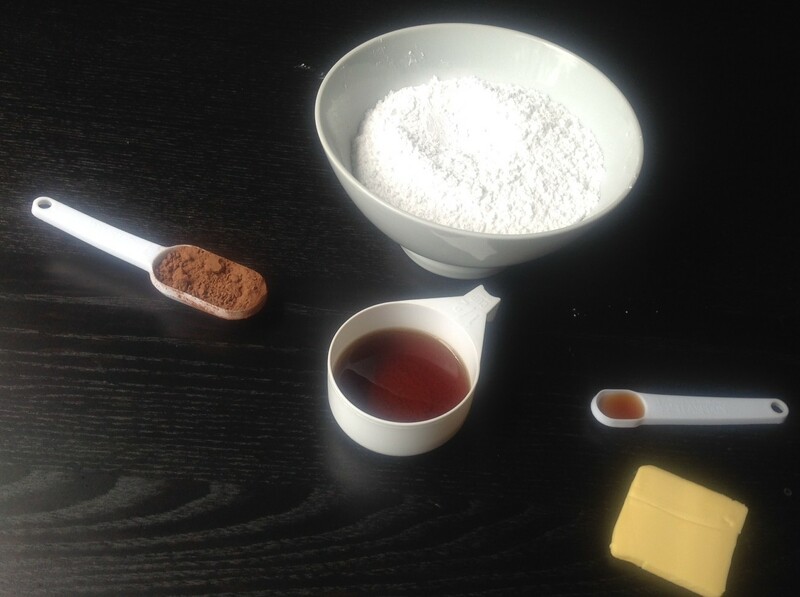 To make the icing – cream the butter in a bowl with electric beaters for 10 minutes. Add the sugar, flour and maple syrup and hand stir until almost combine. Now beat for 5 minutes until fluffy. Cut the cake into 3 even layers, spread the frosting in between the cake layers, top and sides. To decorate place the left over bacon on some baking paper. Place the extra sugar in a pan on the stove and stir until sugar starts to dissolve. Once sugar has turned into a syrup pour over the bacon. Once set place into the food processor until fine pieces have formed then sprinkle over the cake top. 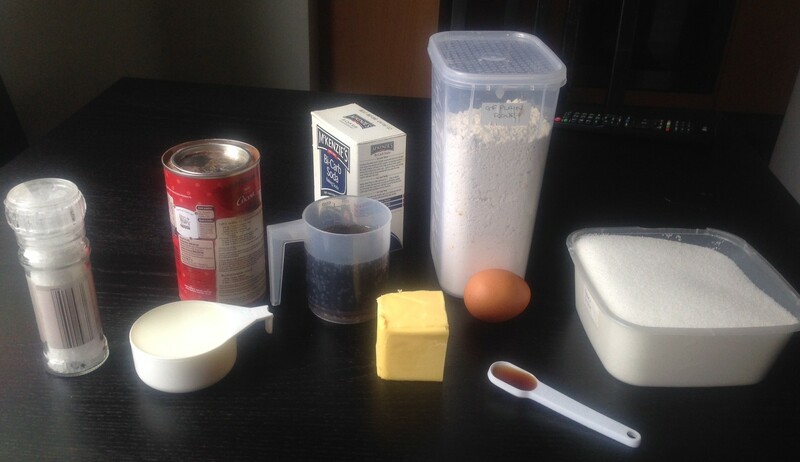 I made cake flour (see common baking questions page) to make them light and fluffy and buttermilk (see common baking questions page) for moist denseness. 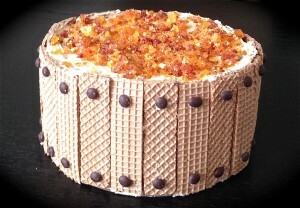 Tags: bacon, chocolate, chocolate bacon cake, chocolate bacon cake with maple frosting, maple	. Posted on May 12, 2014 Posted in America, Cakes	. So my all-time favourite dessert in the world is Tiramisu. Coffee, chocolate and Marsala is there a better flavour combo in the world? (I don’t think so)! This got me thinking about other desserts that hold similar flavours, where I was led to the Devil’s Food Cake. This cake has many variations, some with red food colouring, some with beetroots for the colour, some with coffee, some with chocolate, and some with only cocoa powder for the taste. After assessing variations I decided on my ingredients mix that would provide the most rich (but not too sweet) result with a lovely dense texture. To do this I have elected for coca powder and only used chocolate in the icing. I have a good amount of coffee, which complements and amplifies the chocolate taste. Also I have used sour cream for the icing to pull back the sweetness again (as the icing is mostly chocolate). 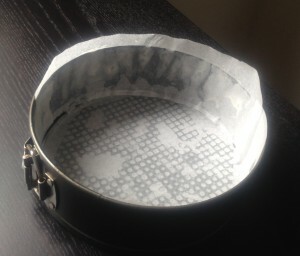 Preheat the oven to 180c and line a 23cm round cake tin with baking paper. Using electric beaters beat the butter, sugar and essence for 5 mins or until it is light and fluffy. Add in the eggs one at a time and ensure you beat thoroughly between each addition. 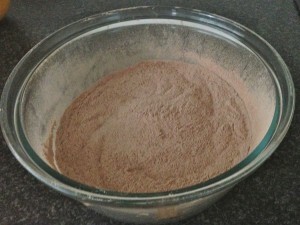 Sift in the flours, cocoa powder and bicarbonate of soda into the sugar mix, stir. 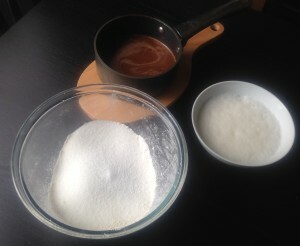 Add 3 tsn of the coffee powder to the water, stir. 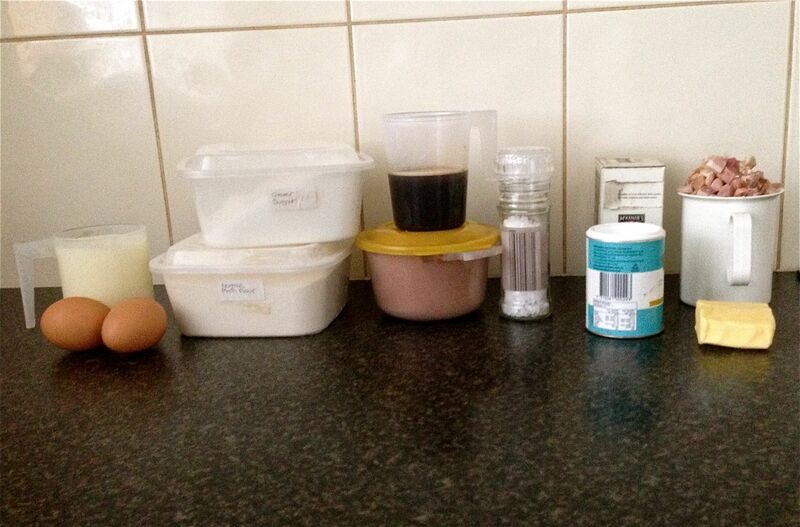 Add remaining tsn of coffee powder to the mix as well as the food colouring, water mix and milk. Pour mixture into prepared pan and bake for 1 hour and 15 minutes or until a skewer inserted in the center comes out clean. 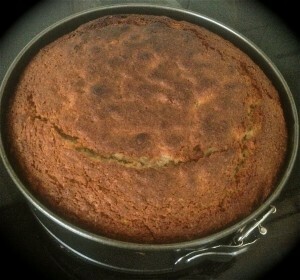 Once cooked leave the cake in the tin for 5 mins, then place onto a cooling rack to cool. 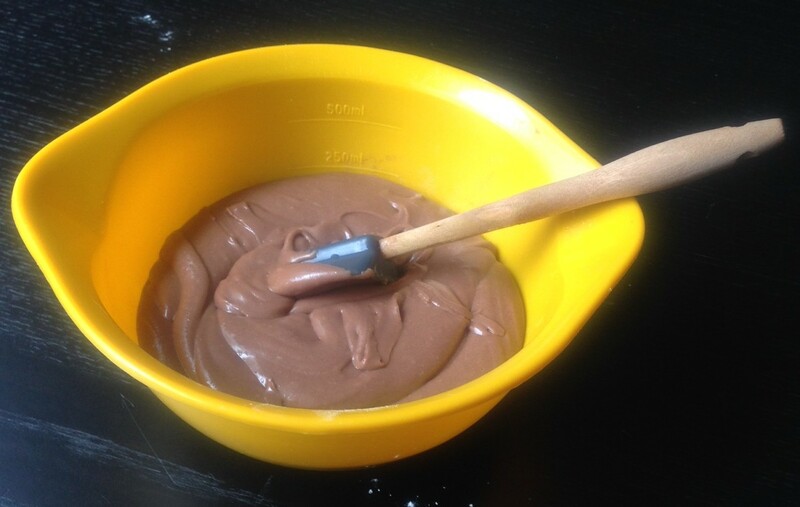 To make the chocolate ganache place the chocolate in a microwave-safe bowl. Microwave on medium (50%) for 1 minute, and then stir every 30 secs with a spoon until just melted. Following stir in sour cream. Cut cake into 3 layers. Spread the ganache on top of the 3 layers as well as the side of the cake. If you don’t like coffee you can omit the coffee powder, however it more enhances the chocolate taste not so much had its own flavour. This will then just be a red velvet cake. I added an extra 2 steps to this for decoration. I placed kit kats around the cake which held in place thanks to the ganache. 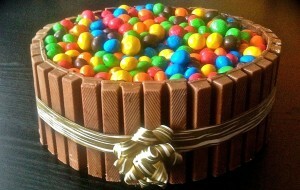 Then I placed M&Ms on top. Deciding against the coffee and red food colouring would mean this is just a dense chocolate cake. 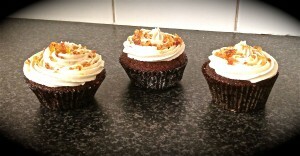 Tags: chocolate, coffee, devils cake, Devils Food Cake	. Posted on January 21, 2014 Posted in America, Cakes	. Give me a sec to explain before you get scared off this post (you will be thankful). Ok so I didn’t hit my head and decide to bake a cake with the first 2 ingredients that popped in my head. Believe it or not there are many versions of a ‘Coca-Cola’ cake. And I promise I wouldn’t post a recipe on my site unless the recipe was super awesome. I also thought that this was taking things a little too far and it would be a disaster waiting to happen. But I promise you that was not the case. The outcome was the most moist and intense chocolate flavoured cake I have had in a while. 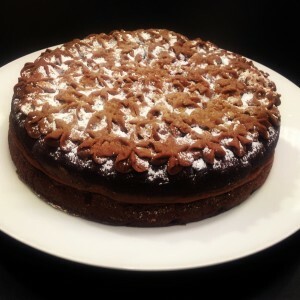 The cola must intensify the chocolate flavour as only 2 tablespoons of cocoa powder go into this cake and no actual chocolate. Personally I couldn’t taste the Cola, the only remnants of it being there was an ever so slight cola after taste as such (which was surprisingly quite pleasant). If you didn’t know it wasn’t a plain chocolate mud cake you would be none the wiser. Having said this though I did get feedback from people saying they could taste a little of the cola…each to their own I suppose. Preheat the oven to 180c and place in a baking tray. Line a 20cm cake tin with baking paper. 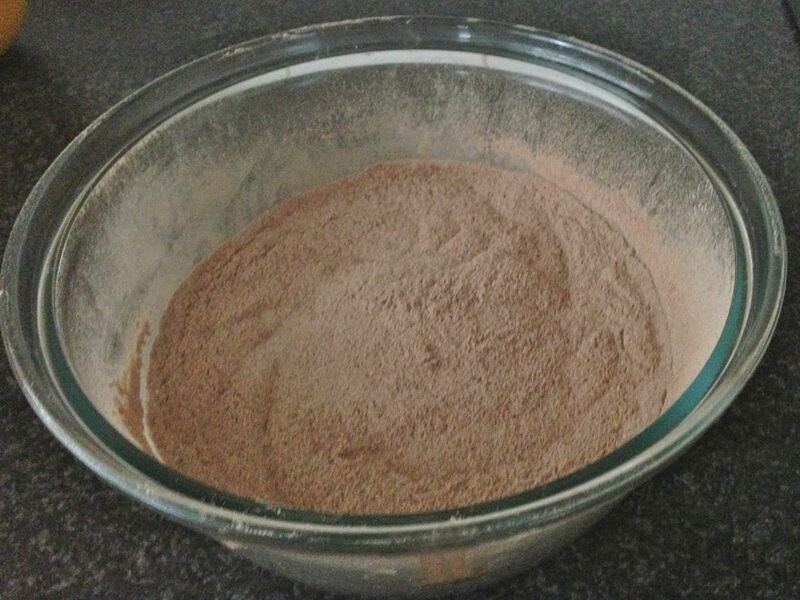 In a bowl add the dry ingredients – flour, sugar, bicarb soda and salt. In another bowl beat with electric mixer the egg, milk and vanilla. In a saucepan on low add the butter, cocoa and Coca-Cola until the butter is melted. Add the butter mix to the dry bowl, stir until combined. Now add the milk mix to the bowl, beat with electric mixer until smooth. 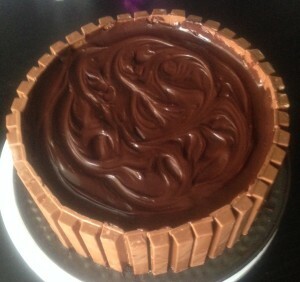 Pour into cake tin and place onto tray. Bake for 50 minutes or until skewer comes out clean. Let it cool for 10 minutes then place on a cooling rack to cool. 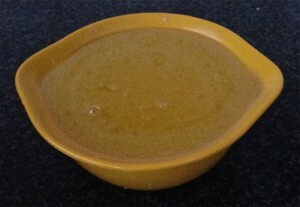 To make the icing melt butter in the microwave. Once melted add coco-cola and cocoa, stir until smooth, add vanilla. Stir in the icing sugar until cominbed then beat until thick and glossy. Set aside for 15 mins to cool and thicken. I used gluten free plain all-purpose flour. I think this was a contributor to the cake being so moist and mud cake like. 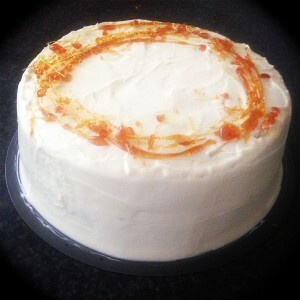 I split the cake in half and spread half the icing in the center of the cake and the rest I pipped on top of the cake. The cake is so rich that I don’t actually believe you need the icing, as an alternative I would serve this with a dollop of cream instead. Only 250g of sugar is in this cake and no chocolate as the cola is quite sweet already, therefore making the cake extra sweet. I used diet Coke when I made this as this is what I had in my cupboard, however if you are a fan of cherries you could use Dr. Pepper or Lemon twist Coca-Cola for example for a little hit of complementary favour fusion with the chocolate. Step 1. Lining the cake tin. Step 9. 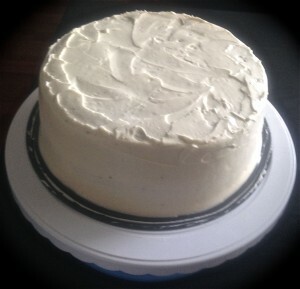 The icing cooled. Like this recipe? 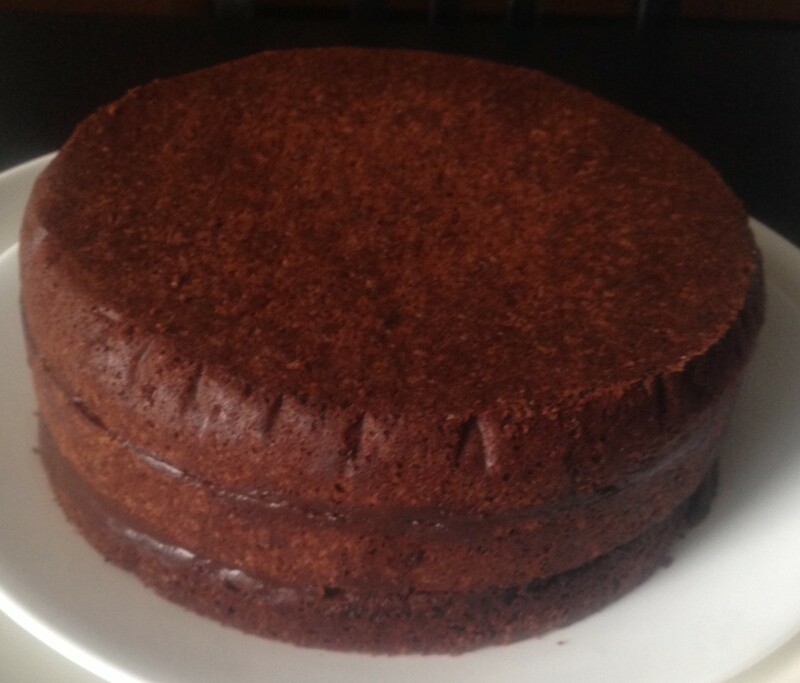 If you love the rich texture ayou may also like my Red Wine Chocolate Cake and my Chocolate Zucchini Cake. Subscribe via RSS or email to get my new entries and more scrumptious recipes with reviews. Tags: chocolate, coca-cola, coca-cola chocolate cake, coke	. Posted on January 2, 2014 Posted in America, Pies, Traditional	. I have mentioned before that zucchini is one of my favorite veggies, in addition to this though I LOVE pumpkin. This recipe could actually be classified as a traditional cultural recipe as Pumpkin Pie is renown as a sweet treat in America (especially at Halloween). Similar to zucchini cake there are many many pumpkin pie recipes but this one is my favorite and has great spices incorporated. If using store brought pastry, roll out on a lightly floured surface then transfer pastry onto a lightly greased 25cm loose bottomed tart pan. Refrigerate for 30 minutes. If you are using a bought tart shell omit this step. Line the pan with baking paper and fill with rice (this is called blind baking which stops the center of the pastry in the tart rising). Increase the oven temprature to 220c. Place all ingredients (how simple is this) into a food processor and process until smooth. Pour batter into the tart case and cook for 10 minutes. Cool, then its ready to serve. I suggest serving with a dollop of cream and a good drizzle of maple syrup. 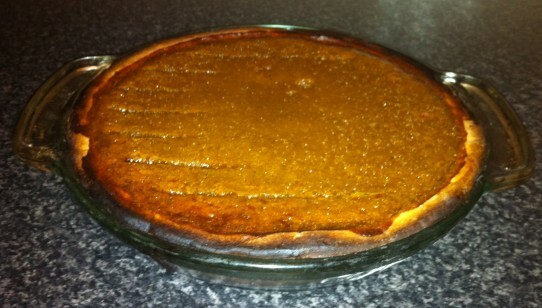 This is not the most amazing tart in the world as its not as sweet as a choc pie (clearly) but it is very tasty, different and a must if you love different spices (also if you love pumpkin like me). Tags: all spice, America, cinnamon, ginger, ground cloves, nutmeg, pastry, pie, Pumpkin, spices	.